Rio Grande City High School Principal, Mr. Jorge Recio, honored all of his staff in a grand way on Friday, August 21, 2009. The high school was ranked by the Texas Education Agency as a "Recognized" campus. Texas is home to 83 5A high schools and only 5 of the 5A campuses received this rating. Mr. Recio was elated with the scores and credits the parents, students and teachers for their dedication and hard work. A feast was prepared in honor of all of the high school staff from the cafeteria personnel, custodians, teachers, and all support staff. Special guests inlcluded were Board Members, District Administrators, Principals, Community Leaders and City Officials. The Rio Grande City Mighty Cascabel Mariachi serenaded the audience as they gathered and and took a moment to socialize with colleagues. The invocation was given by Mr. R.C. Salinas followed by the Presentation of Colors by the Rio Grande City High School JROTC. Mr. Recio was accompanied by his Assistant Principals and Deans of Instruction in honoring the staff in a very special ceremony. "Rio Grande City High School is a community of learners we have really made a difference and we have met our goals with much excitement," said Mr.. Jorge Recio. He also thanked the the school Board of Trustees for their role in insuring that the students and teachers are given tools to pursue great things. The Honorable Ryan Guillen was at hand to congratulate the staff for the accomplishments and the school board for providing the tools for a good foundation by allowing the teachers to succeed. "I am honored for the opportunity to represent you in the Texas House of Representatives," he said. Representative Guillen emphasized the importance of educators and how it is not an easy job, but one of the most vital ones. He feels very thankful for the education that he received in Rio Grande City and applauds the hard work that teachers do to educate the students in the community. To the teachers he said, "Everyday you are confronted with the reality that a life is in your hands. It is an amazing responsibity". The Honorable Judge Alex W. Gabert was also present and spoke of how proud he is to be a product of the Rio Grande City School District and a Rattler. He reminisced on his own education and the values instilled in him by his teachers. He still lives by this standards and attributes much of his success on his eduction in the Rio Grande City Schools. He also credits his mother for making sure he got a good education. He stressed on the sacrifices made by parents everyday so that their children can achieve a good education. Several other past principals of Rio Grande City High School were invited to the celebration to share in the great accomplishment of this high school. Mr. Israel Ybarra and Mr. Mike Villarreal both attended this event, as well as, other special guests that included Dr. Robert Zamora and Dr. Richard Irizarry. 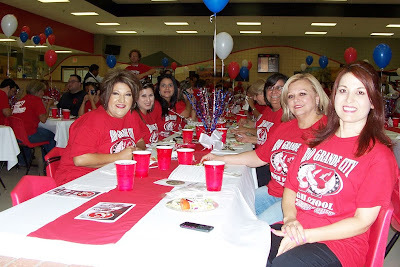 Pictured are Rio Grande City High School educators. (RGCCISD Photo).